Site 29 is identified by the mile marker on Claremont Ave, just west of the intersection with Grizzly Peak Blvd. All the eucalyptus trees were destroyed there about 10 years ago. The trees that were destroyed were chipped and piled on site as mulch intended to prevent the growth of weeds. The trunks of the trees line the road, log reminders of the forest that was destroyed. 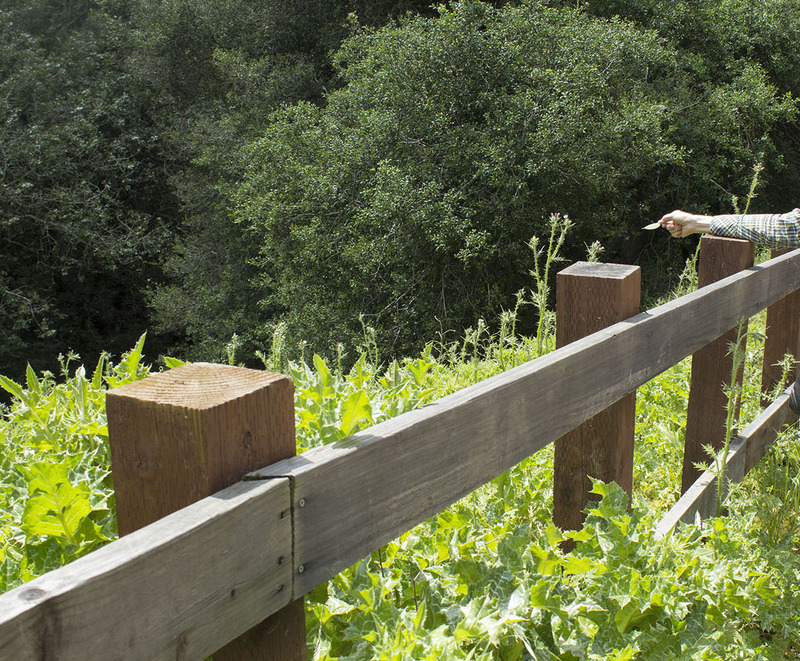 The site was adopted by the Claremont Canyon Conservancy (CCC). 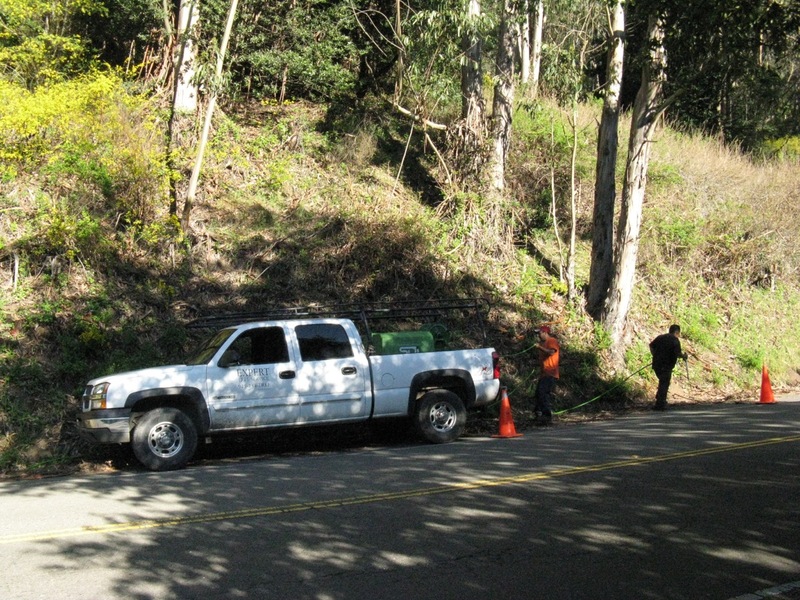 CCC has planted many redwood trees there and they consider it their showcase for their advocacy to destroy all eucalyptus trees in Claremont Canyon and elsewhere in the East Bay Hills. 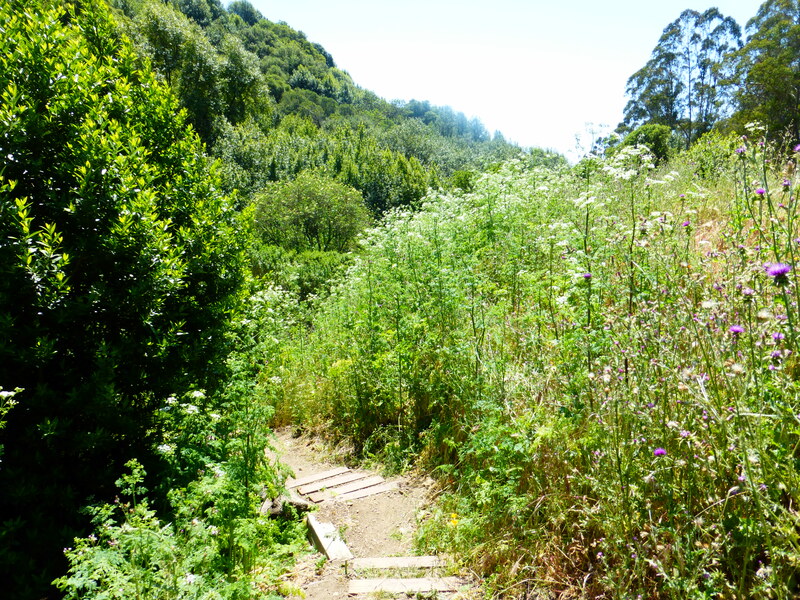 The Sierra Club and CCC have collaborated in the effort to convince the public that if the eucalyptus trees are destroyed, a lovely garden of native plants and trees will replace the eucalyptus forest. They also want you to believe that their garden will be less flammable than the eucalyptus forest. There are several flaws in this rosy prediction. The first problem is that Site 29 is ecologically unique. It is a riparian corridor with a creek running through it. Therefore, more water is available there than on the sunny hills where eucalyptus forests grow. It is a canyon with steeply sloping sides that provide protection from sun and wind, which helps retain moisture. In other words, conditions at Site 29 are ideal for the landscape that CCC and its friends are trying to achieve. Claremont Canyon Conservancy sign at Site 29 says, ““These coastal redwoods…have been planted by volunteers as part of a habitat restoration to create a native and fire-resistant environment in Claremont Canyon.” The sign is planted in wood chip mulch and obscured by poison hemlock and milk thistle, which are both non-native. Site 29 is also unique because CCC has planted many trees there and they have sponsored many work parties to maintain the site. CCC has not made a commitment to plant all 2,000 acres of the East Bay Hills on which all non-native trees will be destroyed by the FEMA grant projects. Nor have any of the land owners made a commitment to plant those acres after the trees are destroyed. So, given the ideal landscape conditions, the planting, and maintenance invested by CCC, how successful is Site 29? Is it a lovely native plant garden? Is it less flammable than the eucalyptus forest it replaced? This is our photo essay of Site 29 that answers those questions. But photos can be deceiving, so we invite you to visit yourself. Just drive east on Claremont Ave until you reach mile marker 29, park your car beside the road and take a walk. When we visited Site 29 in late April the milk thistle was thriving, but not yet in bloom. 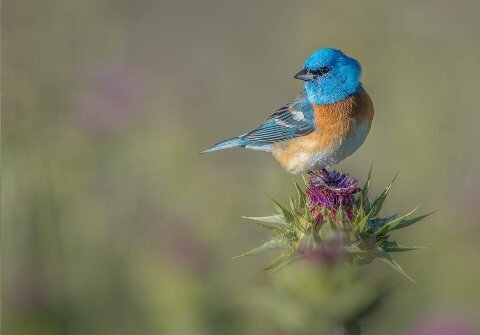 The striking zebra pattern of the leaves makes it an attractive plant, in our opinion, and this lazuli bunting seems to agree that it is a plant worthy of admiration. It is, however, not a native plant. When we visited Site 29 a month later, in late May, it was a very different scene. The milk thistle had been sprayed with herbicide along the road, to a width of about six feet, providing a stark contrast between the dead vegetation and the still green weeds. Poison hemlock now grows along the trail into the canyon to a height of about 8 feet, joining the thistles as the landscape of Site 29. The piles of wood chips are still visible, but are mostly covered with non-native annual grasses and other weedy shrubs. The trail down into the canyon is lined by 8-foot tall poison hemlock at Site 29. The contractors who apply herbicides on UC Berkeley properties have been photographed many times spraying herbicides at Site 29 and elsewhere. When they are observed spraying herbicides there are not any pesticide application notices to inform the public of what is being applied and when the application is taking place. So, unless you see them doing it, you don’t know that you are entering a place that has been sprayed with herbicide. 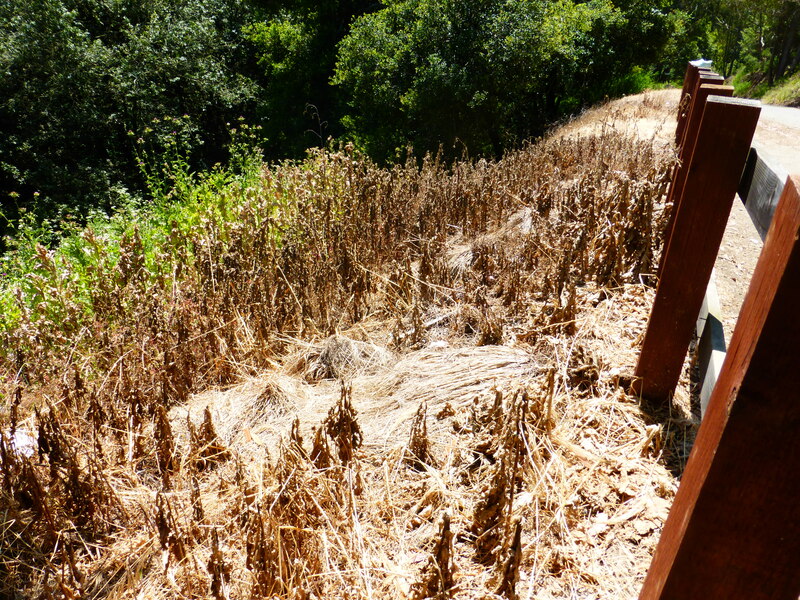 Several days later, you know that herbicides have been applied only because the vegetation is dying and soon looks dead. Herbicide spraying on UC Berkeley property on Claremont Ave. When the Environmental Impact Statement for the FEMA projects was published, the land managers claimed they would use “best management practices” in their pesticide applications, including posting notices in advance of spraying that would remain in place during the spraying and for some time after the spraying. That assurance turns out to be meaningless. Herbicides are being applied without any public notification before, during, or after application. We were under the mistaken impression that posting application notices was required by California law. We therefore asked those who observed herbicide applications without posted signs to report the incidents as violations of California law. The Alameda County Agricultural Department is responsible for enforcement of California’s laws regarding pesticide use in Alameda County. They have informed us that no notices of pesticide application are required for non-agricultural applications of glyphosate (RoundUp) or Garlon (triclopyr; the herbicide sprayed on the stumps of trees that are destroyed to prevent them from resprouting). The manufacturers of these products say they dry within 24 hours, which is the definition of when re-entry is permitted. Notification is not required for pesticides for which re-entry is permitted within 24 hours, even while the pesticide is being sprayed. Would you like more Site 29s? The eucalyptus forest at Site 29 was destroyed over 10 years ago. Therefore, it is a preview of what we can expect when eucalyptus is destroyed on 2,000 more acres of public land in the East Bay Hills. So, what can we learn from Site 29? Site 29 had every advantage: plenty of water, protection from wind and sun, planting of native trees, and maintenance by a volunteer neighborhood association. Even with all those advantages, unshaded areas in which trees were destroyed at Site 29 are dominated by non-native weeds that are more flammable than a shady eucalyptus forest. And because the weeds are flammable, they must be repeatedly sprayed with herbicides along the roads where ignition is most likely to occur. Dead vegetation is more flammable than living vegetation, so the logic of the spraying seems muddled. Most of the 2,000 acres of public land on which eucalyptus forests will be destroyed do not have a water source, or protection from wind and sun. Nor will trees be planted or maintenance provided. They are going to look much worse than Site 29 and they will be more flammable. Sent from ….wait. Where am I? 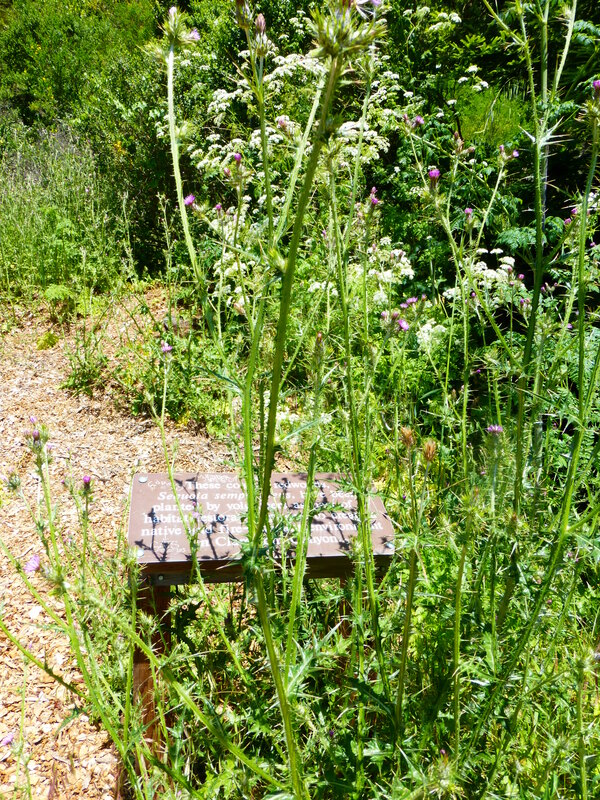 If you actually CARED about Site 29, you would have volunteered to remove the non-native thistle & poison hemlock by hand, as I have done in Claremont Canyon Regional Preserve, so that herbicide wouldn’t have been applied. It is very easy to do with a long-handled set of lopers. .I guess you just like to complain, and won’t lift a finger to help protect our park. Unfortunately, that is how most people operate today. They think that parks are there for them to enjoy without having to lift a finger to help maintain them. While I was working, many people thanked me for what I was doing. But no one offered to help. But you are even worse: you don’t offer to help, you just complain. You aren’t part of the solution, you are part of the problem. Go ahead, censor my comments, as you usually do. If you don’t like the fact that we have freedom of speech in this country, I can suggest some places where you might feel more comfortable, such as China, North Korea, Russia, and Iran. I have been volunteering in my local park for over 5 years. I pick up trash and report problems such as the dumping of household trash, missing trash cans, and full trash cans. That is my neighborhood and the park that I visit regularly. When I lived in San Francisco, I volunteered in my local park there. I had a wider range of duties there because it was a more natural park with less landscape and hard-scape. I value free speech, but I do not feel obligated to publish some of your comments which are essentially name-calling and devoid of any information. The fact that you censor comments only proves that you can’t defend your assertions with facts and logic. You don’t like to have anyone hear the truth. Publish my comments and let people judge. First, not everyone who is trying to defend our parks from being destroyed and poisoned is able-bodied enough to do unnecessary physical work, and even if they were, it makes no sense to try to remove plants that will continue to grow from seed because the trees shading them out have been killed. Second, if MJvande “CARED” about Site 29, they would take a moment to think. learn about why those plants they so hate are there, and question what they are doing. Insulting those who do care about our parks, the animals, our environment, our health, etc. only helps those who are making money off false claims of fire hazard. There is plenty of money to “maintain” our parks if millions were not spent killing healthy trees and poisoning the land and water. Let the land return to being a healthy ecosystem with trees and shrubs, and the wild animals will thrive and the land will be beautiful again. The wild animals already have told us how much they love Eucalyptus, Monterey Pine, etc. And the wonderful variety of plants that grow under them, from the water they provide, tell us too. Please tell us how animals use poison hemlock. Bev Jo, you display a very common misconception about plants, which is disproved by a knowledge of elementary physics. Plants get their energy ONLY through their leaves. And they store a finite amount of energy in seeds and roots etc. So if you continually remove those leaves (e.g. cut the plant at the base), eventually it will die. Because there are some seeds in the ground, you need to come back at least once a year for a few years. But the plants will be smaller and smaller, hence easier and easier to cut. That’s why herbicides aren’t needed. The entrance at sight 29 is ugly and uninviting, Weeds and piles of sprouting chips make the sight look like an abandoned service area. Once on the riparian trail the living vegetation is pleasant enough except (1) the floor of the area along the trail is characterized by large quantities of logs, branches and other dead vegetation left behind by the gardeners. This is not material in natural cycle of death and decay, but a yuge accumulation of cuttings that has been left over a long period of time. The unnatural accumulation of dead debris is a significant fire hazard and it boggles the mind as to why it is left everywhere along the otherwise well maintained trails. (2) Walking along the trail I am aware of how replacement of the tall trees on neighboring hillsides with chips or dry grass as planned will impoverish the beauty of this place. (3) While the trail running along the creek makes for a nice walk, it will be boring if all natural areas are reduced to a similar gardened state with only this same vegetation allowed. Thank you so much for another excellent post!!! It’s been a year since I saw the sneaky notice posted at Ring Mountain in Marin that gave only a few days over the holiday weekend to protest the planned herbicide spraying in such a vulnerable habitat. People who care in Marin county stopped the planned spraying of Ring Mountain and have gotten more people who also care on the Open Space Board of Directors. 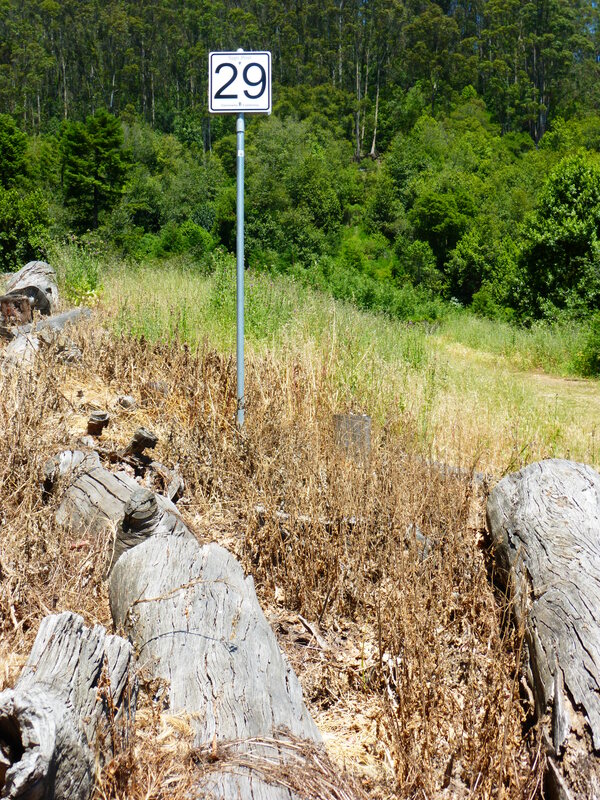 The Marin Watershed District also has stopped spraying, making the reservoirs and land safe for everyone. What a difference to see how Marin manages all that land without the horrific results of spraying poison. So, a year later, the delicious plums introduced by birds are growing and will shade the “weeds” along the beginning of the trail at Ring Mountain. The paths are kept clear by briefly weed-eating in spring, and now the Calochortus is at no risk, while the marsh and creek are finally safe for frogs, newts, etc. What a difference than what it could be. The loss is to Monsanto and Dow, etc. What is never mentioned by those pushing spraying poison is, do we need even one more case of cancer in humans and animals? Can anything justify increasing chronic illness and disability? I am sorry to say that the Agriculture Department of Alameda County has told us there is no legal requirement in California (unless counties adopt stronger legal requirements) that pesticide applications be done from marked containers. We learned this when we reported what we believed to be an illegal pesticide application for which no pesticide application notice was posted. We were informed that California law does not require pesticide application notices before, during, or after applications of glyphosate or Garlon for non-agricultural purposes because the manufacturers’ labels say the herbicides will dry within 24 hours. Follow up questions and answers informed us that labels are not required on the containers from which the pesticide is applied. This is very disappointing information, but I am obligated to report it to my readers.